I like Rage of Destruction, personally - sounds more poetic, to my ears. I feel as though that's how it would be described if someone were writing a saga about this guy. I found that too, but if you look at D&D it has plenty of "nouns of destruction" and "nouns of other things." A quick search turned up Gauntlets of Destruction and a Devil's Ray of Destruction (although I believe the latter is unofficial). Suffice to say that that wording is commonplace in D&D and not necessarily out of place on a Warforged Barbarian. Not the same. "Destruction" in that context is a description of a magical aura the Gauntlets (or the unofficial Ray) have. A "rage" is not a magical thing, like the gauntlets. It is a loss of control and temper, expressed in a violent outburst. "Rage" and "destruction" used this way are two ordinary words, describing ordinary things,* that do not go neatly together the way it's currently written. I started a thread here for people who want help with editing. Use it or not, it's up to you, gentle reader. I figure that way I am less often going to be in Scytale's hair (hopefully, if people use it). I figure that way I am less often going to be in Scytale's hair, and (hopefully, if people use it) I'll be less often in his. Would you trust this man with your editing needs? Last edited by ollie; May 13th, 2014 at 05:47 PM. Reason: Yes, you would, given that he got the edit in pretty quickly. Editing skill in action, right there. "Gauntlets of Destruction" make sense. "Rage of Destruction" makes less sense. In this case, "It is a D&D power with very similar D&D mechanics" would be persuasive to me, but "It sounds like it could be a D&D power" is definitely not. You're using "rage" in the normal sense, not the way it's become in the D&D sense. In D&D it's become, more or less, "a magical thing," something like a "spell of destruction." It's a power, an ability, not a violent outburst. I'll reassert that I prefer Destructive Rage, but I'm not bothered by Rage of Destruction. I can understand if it bothers other Judges, however. I'm leery of Rampage, but I like anything that shares a name with a giant robot serial killer. 'Rage of Destruction' fits with the DnD concept of a rage, so it doesn't bother me (though it wouldn't bother me if it was 'Destructive Rage' either). to the King Crab as well. to Rampage if that wasn't clear. I could also have gone with ;up; to the Mechanical Tiger, tiny Mechanical Tiger, Mechanical Tiger made of fake legos, Bulldozer, or gull-winged sports car (but only if we were Japanese). Rage of Destruction was a suggestion given to me in the Pre-SOV thread. I like Destructive Rage better. And I just saw your thread on editing Dad-Scaper and fully intend to make some use of it! Good idea thanks! Rage of Destruction was a suggestion given to me in the Pre-SOV thread. I like Destructive Rage better. Does this mean you're going to change it to Destructive Rage? I don't think that will change any current votes. Yes that was my intent. Last edited by William099; May 16th, 2014 at 04:56 AM. I would like to nominate my custom Ashi-Dhulu for your consideration, SoV. He is the Purple Worm from the Reaper Legendary Encounters line. Playability- The powers read clearly and are in order of activation. Before moving, you can choose to Devour. 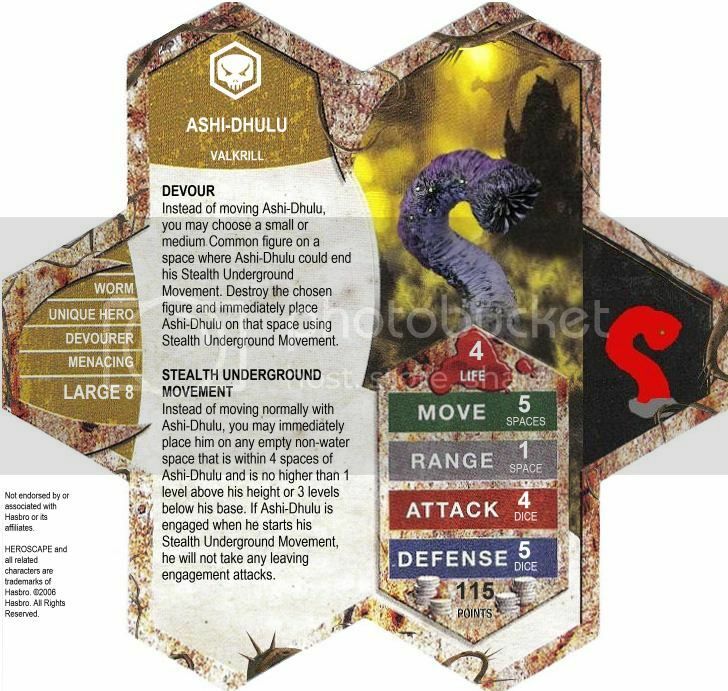 You chose a small or medium common figure where you can end Stealth Underground Movement, destroy that figure, and place Ashi-Dhulu on the space the figured occupied. Stealth Underground Movement is a Disengage version of Earth Elemental's Special Power. Creativity- A Purple Sandworm that jumps around the board auto-destroying small or medium figures once a turn? He plays very uniquely. He's strongest as a clean-up figure, and stands a decent chance against heroes. If the opponent can muster focused attacks on him, he won't last very long. He can also be baited into unfavorable positions with Devour+Attack placement. The Sandworm of Dune, which he is based off of, has several common names, and one of them is Demon of the Desert. His name is an anagram of thier Fremen name, Shai-Hulud. Accessibility-The miniature is part of the Reapers Legendary Encounters line, and as such it is reprinted every once in a while. The line itself is going to be reprinted again this summer. Last edited by MegaSilver; June 7th, 2014 at 11:24 PM. Reason: Updated Card.